Found one file extension association related to SYSTRAN Home Translator and 1 file format developed specifically for use with SYSTRAN Home Translator. 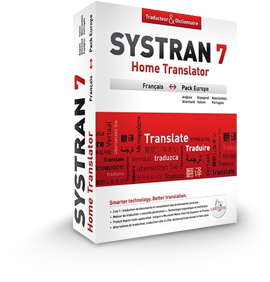 SYSTRAN Home Translator is the ideal tool to meet the everyday translation requirements of home and home office users. SYSTRAN Home Translator allows you to install a translation toolbar easily accessed from the Windows desktop. This means that you can translate Web pages, Word documents and any other kind of text (e.g., e-mail or instant messages) in just a few seconds. Simple to install, easy to use and attractively priced, this translation software product is the perfect tool for families and home users. If you need more information please contact the developers of SYSTRAN Home Translator (SYSTRAN), or check out their product website.